I have always something of an uneasy relationship with farce: it has never been a form of theatre that I’ve much enjoyed though I have tried repeatedly, A Flea In Her Ear, Once Bitten also at the Orange Tree, and most recently One Man Two Guvnors which has won over many new fans if not myself, something about the determination of audiences to laugh loud and long right from the start turns me off and it is often the case that that divide from those around you is extremely difficult to overcome through the play’s duration. But I am one to suffer nobly for my art and so the journey was made once more to the Orange Tree is Richmond to see not one, not two, but Three Farces by John Maddison Morton. Director Henry Bell and editor Colin Chambers have pulled together 3 short pieces by Morton, a Victorian playwright who has largely fallen from favour and received little attention despite being well acclaimed by Kenneth Tynan, representing different facets of his writing (he wrote over 125 plays) which borrowed from the strong French tradition of farce but also incorporated an English sensibility which works extremely well and made this a more enjoyable evening at the theatre than I had anticipated. Much of this is due to the wonderfully warm staging which eases us in with a great opening introductory sequence (which quite frankly all theatres should employ) led by Daniel Cheyne’s impish and ukulele-bearing Master of Ceremonies and the frequent acknowledgement of the audience that reminds us of its origins as theatre for the masses in a time of great social change. 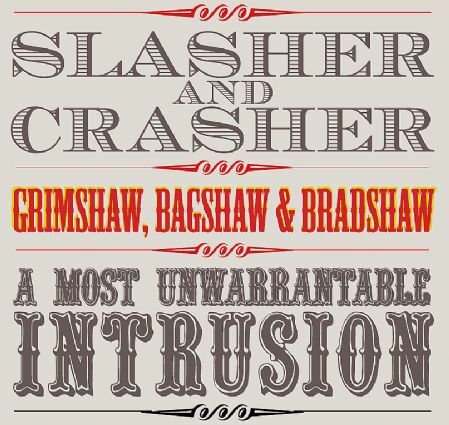 The three stories – Slasher & Crasher, A Most Unwarrantable Intrusion and Grimshaw, Bagshaw & Bradshaw – were all good fun in their own way. Grimshaw et al centred on Stuart Fox’s ordinary guy whose lodgings which are invaded by a series of mistresses, ne’er-do-wells, Cockney ganglords and other intruders as everyone seems to be on the run from something or someone. His admirable struggle against the increasingly insane set of circumstances that comes to pass was highly amusing and contained some of my favourite jokes of the night. A Most Unwarrantable Intrusion was a touch more low-key, a two-hander featuring Clive Francis and Edward Bennett which veered closer to thriller territory with Francis’ home-owning Snoozle contemplating a well-earned day of rest when an unexpected visitor shatters the calm and their verbal duelling is taken to absurd levels as we come closer to finding the real connection between the two. Both actors are brilliant here and the way the unexpected ending is brought to its conclusion drew one of the loudest laughs of the evening. But it is the first farce, Slasher and Crasher, that I found to be the most enjoyable and the funniest, and indeed my only real criticism of the evening would be in the sequencing as the riotous fun here would be better placed as the finale in the triple bill. An irascible uncle declares the suitors for his niece and sister to be unsuitably cowardly and so they are forced to prove their manliness in a duel with all sorts of ‘helpful’ advice coming at them from all angles. Francis again was superb as the disgruntled Uncle Blowhard, his chameleonic changes in all three make him the star of the evening, David Oakes and Stuart Fox are amusing and frightfully hard-working as the titular duellers and Edward Bennett’s Lt. Brown is a riproaring delight. So why the change of heart from me? Admittedly, there is the element of mindset going into a farce as someone who isn’t a fan: I have been trying my best to be as open-minded as possible to the possibility I might enjoy myself as I did this Friday night (though my companions at One Man Two Guvnors might disagree with me), but there’s something more here. The aforementioned English sensibility lends a gentler edge to much of the comedy here: there’s much less poking of fun at afflicted individuals or funny foreigners and more of a personal thing and I also enjoyed the lesser reliance on the more slapstick physical side of things (no cream-pies, fire extinguishers or walking repeatedly into doors here). Rather, there’s a gentler pace which allows for genuine humour to be built up and savoured, rather than the manic rapid-fire pacing that is often associated with this genre and I would venture there’s as much skill, if not more, in constructing the former over the latter. The structure of the evening also means that nothing outstays its welcome, the consistently excellent interactive (but never intrusive) relationship with the audience put a smile on my face every time and Cheyne’s musical interludes are a valuable addition. Whilst I would not go so far as to say that I have been converted into a farce-lover, Three Farces was a considerably enjoyable evening of warm comedy, affectionate humour and (in the door-less in-the-round Orange Tree) proof positive that you don’t need a man running into a door to make people laugh in a farce.